As I was looking through some youtube videos today, I realized that someone had left a comment on one of the videos I had uploaded. And it was one of the video advertisements we had created for our Marketing Project which was for Nokia. My group was G7 (which is my brilliant CAN group at AIM) which was composed of Laurice Alaan, Clarence Lim, Moksh Walia, Sabyasachi Chakraborthy, Anjan Reddy, Shravan Bhat and myself (Kumaran Mahendran). We came up with a new product that Nokia would have to launch in order to take on the might of Apple and Blackberry in the smartphone market where Nokia was failing. We also had to come up with a Marketing plan for the four Ps and also come up with video advertisements. The product we came up with was Nokia Convergence - which basically is everything but a phone. Converges all of the activities we do on our real life into our mobile phone. Technology that is not only intuitive but adaptive to each person thus each phone being unique from the other. 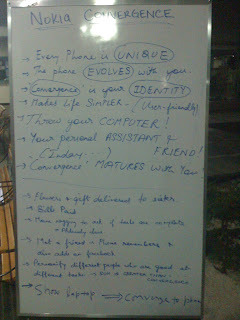 Right from remembering contacts we meet on the street to tagging the same contacts on facebook and other pictures and intuitively carrying out 100s of other activities of ours - the phone would become a virtual assistant as a product and make laptops and other devices totally irrelevant. Such was the product we thought of. Have a picture here showing how we discussed to come up with this product and the marketing campaign. We sat for hours that night to come up with how we would launch the product right from the distribution setup to how the promotions would run. If I'm right, our entire thesis on the same was about 150 pages in size. Have also attached videos here showing our final output on the advertisements. We came up with three videos along with Dr. Vinod Seetharaman who helped us put together the videos on his Macbook Pro (The same guy who motivated me to get a Macbook Pro). The first video is a teaser which starts months before the launch. The second one is to go live about a week before the launch and the final video ad is for the post-launch period! Please share your comments on the same.